"Was then 1927 in Javirnik. Was with us in house 12 children and we were hungry. I came from school and say to mother that I want to eat. We had fields but not have a good farmer. Our father knew how to make children but on bread for children could not earn. "Mother says to me, "Dmitro, maybe you write to your uncle in America, maybe he will save us." But I was only in first class. I couldn't write well and what mother said, so I wrote. Some 4 weeks later, my uncle wrote, "Sister Mary, I am sending you $50 so that you can buy bread for the children not to be hungry." "When I read this letter to mother, she grabbed the letter from me and started to run around the house crying and hollering, "My loveable brother." Then we all children cried with our mother. So was joy and tears. I was then 8 years when was hunger in 1927, 1928 and 1929. "In your mother's family, there was also many children and they had much fields. But with them was bread for your mother's father took better care of his children. I know this. When your mother's father came from church, so always stopped along the road to talk with us, for my father and your mother's father were godfathers to each other's family. So honored each other with visits. " "You asked that I write how your mother lived and grew up, in what kind of house, so I write. Such houses were under straw roofs. And people, very much in poverty, who could not work the ground, ate oats. But the earth was good only people were withdrawn. "Few knew how to write or read since Javirnik had no schools. Then young people started to learn. In 1927 when I started to go to school, this school was in Farmer, close to your mother's. Then they built a new school in 1930. In Javirnik there was not even one house. Entire village was overgrown with woods and Kypruva. My mother said that sometimes people ate the bark of trees and pigweed. I ate pigweed because there was no bread. "I am enclosing a map to your house. It was called Wahala Wachalivski Mukolai. Your mother grew up here in house #1. It was a big enough farm, with much ground. I went there on Sundays to visit the boys, your mother's brothers. This house was smoky without a chimney and covered with straw. 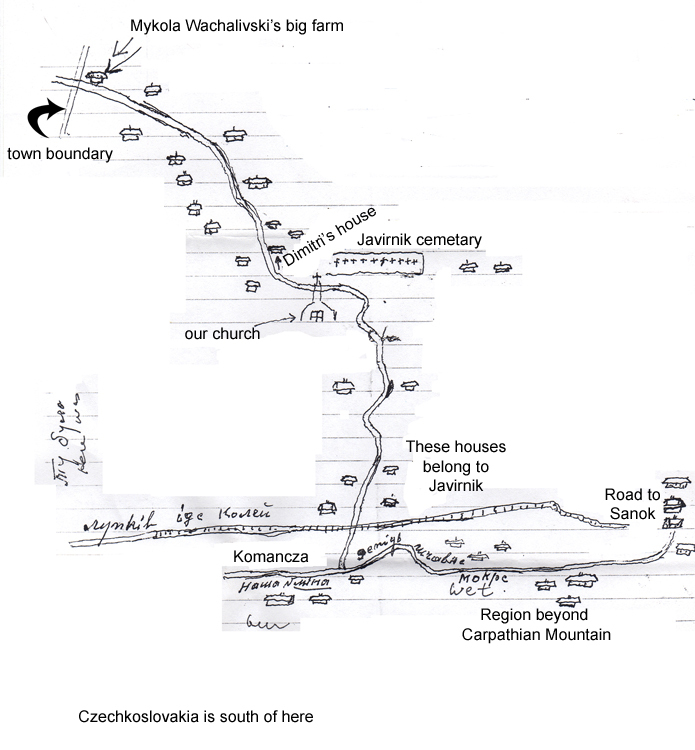 When about 100 houses were built , Javirnik was about 10 kilometers long (6.2 miles) and the roads were not good, very muddy. The Day question: When did you begin your work on the Famine of 1921-23? In your book (Holod 1921-1923 i ukrainska presa v Kanadi. Materialy uporiadkuvav i zredahuvav Roman Serbyn. Toronto, Ukr.-Kan. Doslidcho-Dokumentatsiinyi Tsentr, 1995. (700 pp.) you published all the materials about the famine that appeared in Ukrainian newspapers in Canada at that time. You published photographs as well, and you have written several articles on various aspects of this catastrophe. Roman Serbyn: I started to research the Famine of 1921-23 for a paper to present at the 1983 UQAM Montreal conference that I mentioned earlier. Later, to expand my knowledge, I worked in archives in Europe, the US, and the UK, as well as at the Red Cross in Geneva. There is a lot of material. This famine was not a taboo subject for the Soviets but the way it was presented was really a perversion of the facts, especially with regards to Ukraine. In 1921 and 1922 there was drought in Russia: along the Volga, in the Northern Caucasus region, and in the southern half of Ukraine. But in the rest of Ukraine the harvest was good, and there were enough reserves to feed the whole Ukrainian population during those two years. Yet food was taken out of Ukraine and sent to Moscow, Leningrad, and the Volga region. Also, in the first year of the Famine, when Lenin, Gorky, Patriarch Tikhon, and Chicherin made an appeal to the West for help, all of them specifically left out any mention of Ukraine. Lenin denied, until the end of 1921, that there was even a famine in Ukraine! Until the end of 1921 Lenin denied that there was even a famine in Ukraine! The US sent relief to Russia in August 1921. Credit must be given to American Jews for opening up Ukraine to famine relief. Jews in Ukraine were writing to their relatives abroad and outlining the conditions of famine, and this mobilized the American Jewish community. The Jewish Joint Distribution Commission, which was already involved with the work of the American Relief Administration’s work in the Volga region, insisted that a fact-finding mission be sent to Ukraine. Eventually, Moscow agreed to allow Joint-sponsored ARA aid to be sent to Ukraine. The ARA insisted that the food kitchens in Ukraine could not be restricted to Jews. A compromise was reached, and the kitchens were opened to everyone but were set up in heavily Jewish areas. As a result, most of the aid did go to Jewish citizens, but other people were also fed and this aid alleviated the over-all situation. After examining the circumstances of this famine, we cannot avoid the conclusion that this tragedy could have been avoided. And I have argued that just as with the Famine of 32-33, this was a man-made famine. The difference was that while in the 1930s this was a direct genocidal undertaking by the government, in the 1920s the Soviet government took advantage of adverse natural conditions and used them to its advantage.